Fill out our simple form and get quotes from local bubble football hire companies. Bubble football is quickly becoming the must-do activity in the UK for any social event, and for good reason! This no holds barred version of the beautiful game allows all the tackling and shoving you can get away with as you bounce right back! 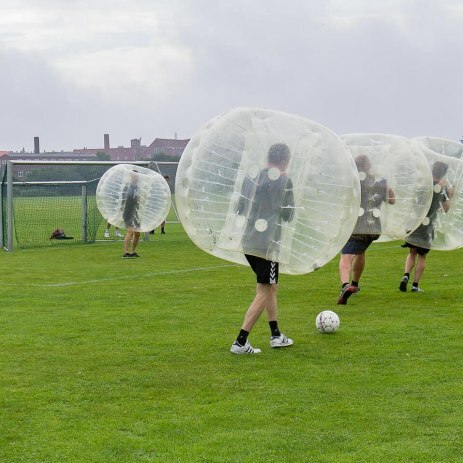 View bubble football suppliers here. Never done Zorbing before? Check out our image gallery and YouTube channel for an insight into the world of ZORB Football. The game we all know and love has been given a completely new dimension with the addition of bouncy body zorbs, worn by each player. Release your inhibitions and get stuck in to this deliriously fun game, just make sure you're prepared for a bumpy ride! Often referred to as zorbing football or bubble soccer this game creates the fun and banter for a stag do or birthday party to remember. Anyone can join in the game of bubble football, and everyone’s talking about it, so why not give it a go? There’s no room for any fancy footwork, as players are encouraged to bump, crash and bounce into each other while trying to control the ball. Make zorbing football the highlight of your event and select the bubble football hire suppliers you’d like to receive quotes from here.